Rohan Quine’s novel The Beasts of Electra Drive (a Finalist in the IAN Book of the Year Awards 2018) was recently performed by Quine to camera through an autocue, with spongy walls of off-camera foam on either side of him. The resultant audiobook format of the novel has just appeared at the audiobook retailers, including Audible and iTunes/Apple Books. The resultant video-book format of the novel is now available too, free to watch, and can be seen via the link on this page, in the form of 120 video-book versions of the novel’s 120 mini-chapters. Accompanying them is an array of short-’n’-snackable teasers from the video-book, many of these teasers being less than a minute long. The video-book and audiobook formats both resulted from the same recording, and are both complete and unabridged versions of the book, with the same text as in the paperback and ebook formats. A limited number of give-away codes for the audiobook are available, which enable a free download of the audiobook by anyone who fancies hearing it with a view to writing a review of it at any of the retailers’ sites, or on their own blog or Goodreads or Facebook. If this sounds like you, then please feel free to drop a line to the author on rohan[dot]quine[at]outlook[dot]com. 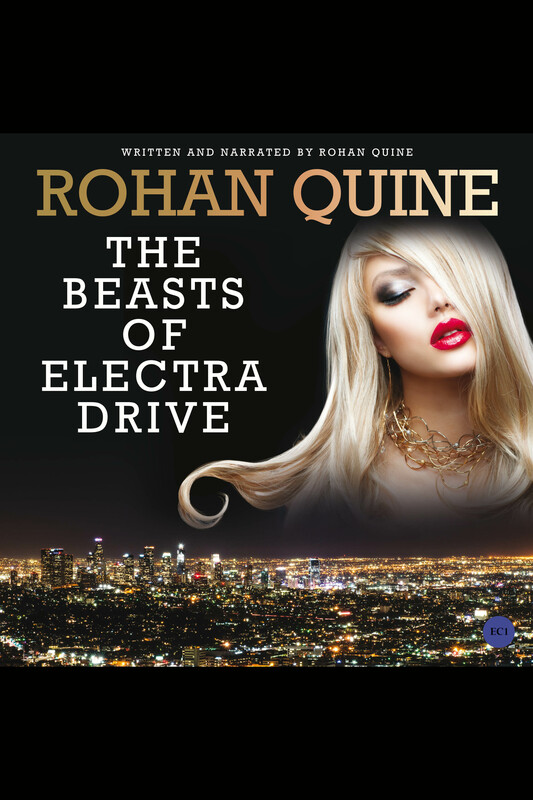 From Hollywood Hills mansions and Century City towers, to South Central motels and the oceanside refinery, The Beasts of Electra Drive by Rohan Quine spans a mythic LA, following seven spectacular characters (or Beasts) from games designer Jaymi’s game-worlds. The intensity of those Beasts’ creation cycles leads to their release into real life in seemingly human forms, and to their combative protection of him from destructive rivals at mainstream company Bang Dead Games. Grand spaces of beauty interlock with narrow rooms of terror, both in the real world and in the incorporeal world of cyberspace. A prequel to Quine’s other five tales, The Beasts of Electra Drive is a unique explosion of glamour and beauty, horror and enchantment, exploring the mechanisms and magic of creativity itself.